The Beige Book was released today with mostly positive findings. Districts generally reported moderate growth across the board. Transportation and manufacturing industries claimed moderate growth, while construction and real estate were slightly less positive. 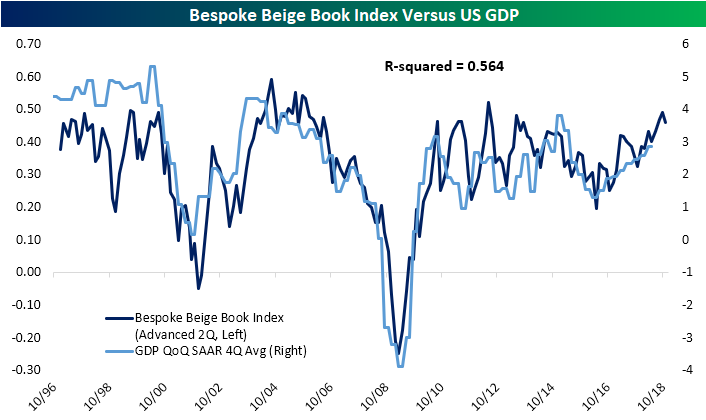 Our Bespoke Beige Book Index is still showing growth, but saw a decrease from the last period. The index is constructed by comparing the prevalence of positive words and negative words in the Beige Book. As shown in the chart below, we show the relationship between GDP and our Beige Book index. On the other hand, trade tensions’ effects on prices alongside a tight labor market seem to be the greatest constraints on the current economy. A common concern among contacts has been the implications of trade tensions. Many cited tariffs as having an effect on input prices but were unable to pass costs along to customers. This was especially prevalent among manufacturers. Even though they have not been widely felt yet, rising prices are likely looming on the horizon. The other concern which had widespread impacts was the tight labor market. Firms’ statements in the Beige Book are echoing Tuesday’s NFIB Small Business Optimism Index and JOLTS releases. Firms are having trouble filling roles for both skilled and unskilled labor. To try to fill openings, aside from higher wages, employers have resorted to additional benefits, vacation, and even increased training programs. Despite these efforts, firms just cannot seem to attract enough talent, although we wonder how bad things can be if simple wage hikes aren’t on the table.